"We're not gonna shoot anyone, we're just gonna have some fun." If I'd seen Idiot Box a few years ago, I might have enjoyed it quite a bit more. An Australian release that did little business in North America outside of the festival circuit, it is a gritty comedy in the vein of Lock, Stock, and Two Smoking Barrels, but with an interjection of social commentary, ala Trainspotting. Of course, in the past five years I have seen both those films, and both better accomplish what Idiot Box attempts. Still, it is stylish character piece that remains entertaining throughout. Kev (Mendelsohn) and Mick (Sims) are two lazy, unemployed friends who still live with their parents. They spend their days as eternal teenagers, drinking, watching violent movies, and getting into fistfights. In a fit of boredom, Kev suggests that the two pull a bank heist�he's sick of being poor, and besides, it will be something to do. Little do they know, a team of cops is already tracking a serial bank robber, staking out the very bank the boys plan to hit. Despite the scenes of violence and a dark, oppressive shooting style, Idiot Box plays, for a large part of its running time, as a near comedy, as the two leads repeatedly bungle the organization of their robbery. Thrown into the mix are a love interest for Mick (played by Robyn Loau), and her brother (John Poulson), who joins the group. Interspersed between scenes of action (the stealing of a car, the procuring of a gun) are isolated vignettes, where the characters discuss, in rather loaded dialogue, various issues of social import. It is in these scenes that the film begins to falter, as nothing of much interest or insight is introduced. Commentaries on violence on TV and a generation of laborers with nowhere to work are perhaps worthy inclusions, but they don't seem to tie into the picture as a whole, and the result is thus somewhat fractured. I did, however, quite enjoy the somewhat whimsical ending, even if it did seem to go out of its way to be "hard-hitting." The performances are good across the board, but I admit I did have some troubling making out the dialogue through the thick Aussie accents. Mendelsohn is a charismatic lead, and he fits well the role of fiery, barely controlled ringleader Kev. Sims is appropriately low-key as Mick, Kev's foil, and he does his best work in his romance subplot. The supporting characters, aside from Loau as Mick's Lani, are played for comic relief, albeit of the tongue-in-cheek variety. Director David Caesar has infused the film with a quick pace and a lot of stylistic flourishes, appropriate for what is purportedly a semi-satire of the TV Generation. Fans of quick cuts and MTV style filmmaking won't find much to enjoy, but these elements really do add energy to a sometimes plodding screenplay. Image Transfer Review: Idiot Box was a fairly low-budget film, and the transfer shows its faults, but overall, the image isn't too bad. The opening scenes look very grainy, but thankfully, this eases off a bit. Darker scenes do show a bit of grain, but nothing major. Colors appear a bit washed out, and there are several instances of artifacting and shimmer. The print used for the master was in excellent shape, with no obvious scratches or marks. Audio Transfer Review: This PCM 2.0 track is acceptable for the material, and nothing more. The oppressive rock score is well conveyed by the front mains, and is mixed well with the dialogue, which is always clear. Sound effects don't carry a lot of weight in the lower registers, and tend to sound unsupported and harsh. There is no action from the surrounds at all. Extras Review: Extras are rather sparse, limited to the trailer, some brief filmographies, and a five-minute featurette that is a bit better than most of these glorified press-kits, but still far too short to deliver any real insight. 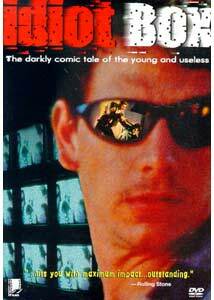 Idiot Box is, unfortunately, a very stylish, well-directed film with an occasionally idiotic script. It seems to want to say something important, but it ends up saying nothing much at all. The characters are compelling, and there are some funny or telling moments here and there. Worth a look for fans of independent cinema.